Single Girl. One Room Flat. Lynn Emanuel holds a BA from Bennington College and an MFA from the University of Iowa. She is the author of three books of poetry, Hotel Fiesta, The Dig, and Then, Suddenly, which was awarded the Eric Matthieu King Award from the Academy of American Poets. 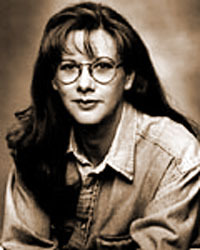 Her work has been featured in the Pushcart Prize Anthology and Best American Poetry in 1994, l995, l998, 1999, and 2000. She has been a poetry editor for the Pushcart Prize Anthology, a member of the Literature Panel for the National Endowment for the Arts, and a judge for the James Laughlin Award from the Academy of American Poets. She has taught at the Bread Loaf Writers' Conference, the Bennington Writers' Conference, The Warren Wilson Program in Creative Writing, and the Vermont College Creative Writing Program. Currently, she is a Professor of English at the University of Pittsburgh, Director of the Writing Program, and Director of the Pittsburgh Contemporary Writers Series. In addition to her books, her work has been published in Parnassus, American Poetry Review, Poetry, The Hudson Review, and Ploughshares.